Maybe this sounds familiar to you: I used to log in to each and every individual network to compose new posts, check what’s happening in my streams, follow up on conversations and follower requests, and basically perform any other little bit of social media management that was on my plate. I switched to dashboards and tools, and my productivity has soared. I’d love to share a bit about how I made these changes and the best tools and strategies I’ve used for handling multiple social media accounts—whether you’re juggling your personal brand in multiple places or handling a mix of company profiles and personal profiles. I’d love to hear from you on what insights you’ve learned as well! My biggest time-saver has been using media management dashboard where I can manage all my social media profiles from one central place. 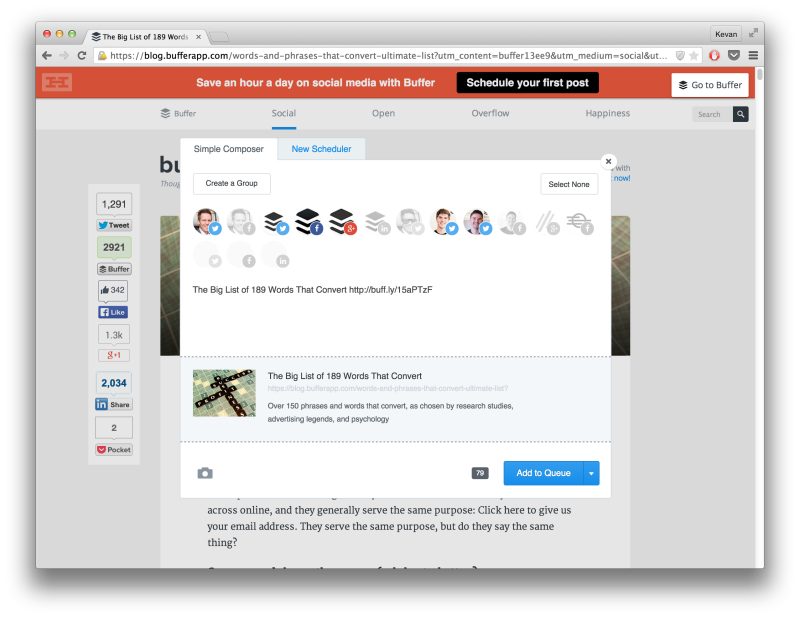 At Buffer, we’re aiming to build a simple, clean, and intuitive tool to help with just this, and we’re so inspired by other dashboard tools like Hootsuite and Sprout Social. All are great options. Once you connect your multiple social networks to SumAll, it’ll start pulling data and insights from your accounts, dropping the numbers into a central dashboard of analytics. You can then check up on these stats by visiting the app, or you can ask for a daily or weekly email with all the info. Still in open beta, this tool collects your social media streams and displays them all from within the Feedient app. 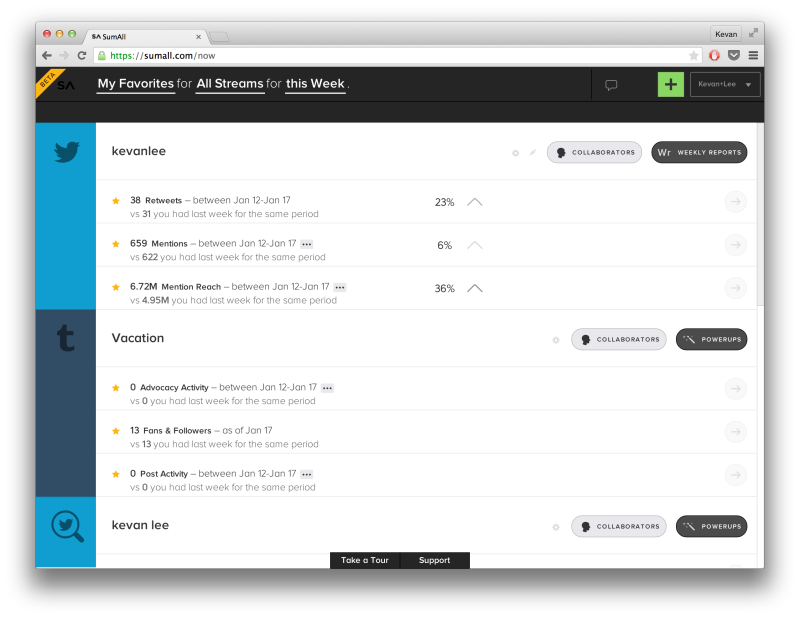 Feedient uses columns to show each channel’s content, similar to how Tweetdeck organizes feeds and lists for Twitter management. You can rearrange and organize as you’d like, and you can engage with the shares and updates from right within the app. One helpful way to save time when managing multiple social accounts is to cut down on the number of times you must visit each network individually. One area of assistance here is pulling updates from your most valued accounts out of social media and into your inbox. Social Hunt connects with Twitter to give you the updates from people you choose—with digests sent immediately, every three hours, or daily. For a quick and simple way to check the share count of your site’s content, plug your main URL into SocialCount and see the results. SocialCount gives you the top shares for each unique article on your site, aggregating data from Facebook, Twitter, and LinkedIn. I’ve found great use with BuzzSumo in performing keyword and idea research for blog posts. 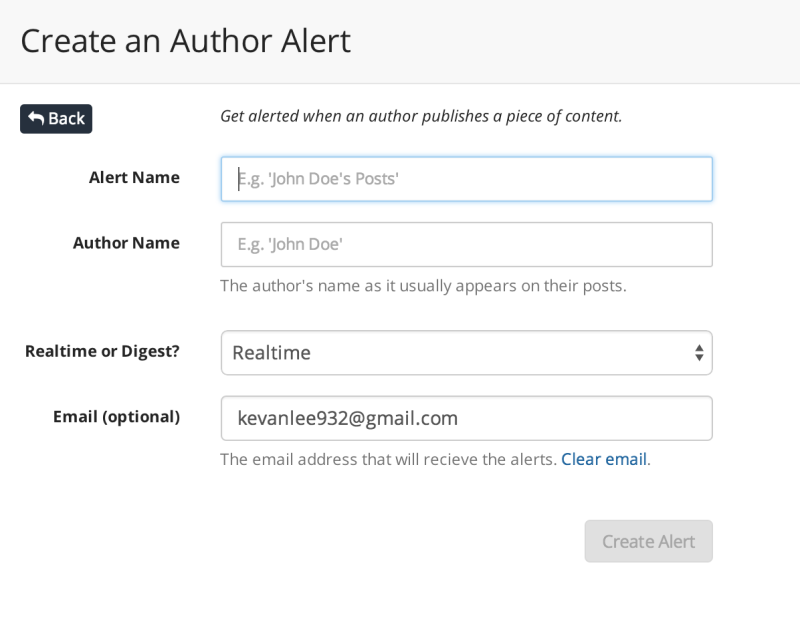 Their Alerts tools has some great applications for managing multiple social media accounts as well. Instead of visiting each social network to spot mentions, you can tell BuzzSumo to email you any time your name or company name appears in highly-shared blog posts. The single biggest help for managing multiple social media accounts is the ability to access everything from one location. Think of it like grocery shopping: You’ll save time if you can pick up bread, orange juice, ice cream, and napkins at one supermarket rather than stopping off at four different locations. Social media dashboards (like Buffer and others, mentioned above) are ideal for this. It’s one of the most popular time-saving social media tips out there. It helps save you time by letting you batch your social media updates all at once and still share at multiple, best times throughout the day. It helps make sure that you maintain a consistent publishing schedule andalways have good content coming up next. The social media management tools listed above (Buffer, Hootsuite, Sprout Social, etc.) each allow for scheduling. Buffer’s queue system allows you to set up a series of optimal times in advance and publish one piece of content from your queue at each scheduled slot, or to schedule at specific times regardless of queue. Engagement stats like reshares and replies are some super signals that people are excited to connect with you. Finding and replying to these people is a great social media strategy, made easier when you can access all this interaction from one place. In Buffer, you can click on the analytics for reshares/retweets and comments/replies to see a list of who has interacted with you. You can follow back directly through Buffer, and you click through to your original update to share a response. Let’s say you follow 1,000 people on Twitter, 500 people on Facebook, and 50 people on Instagram. That’s a ton of content to keep up with on a daily basis! One way to help out with these multiple accounts is to place the accounts that are important to you into their own silos. On Twitter, you can create a Twitter list of followers or track a topic with a saved keyword search. On Facebook, you can add people and pages to interest lists. With a tool like Nuzzel, you can see the top content being shared among all your followers on Twitter and Facebook. A popular method of displaying stats on social media is to show them as week-over-week growth. This is super great in so many cases. Yet, sometimes it can be a bit misleading. What if you had a really spectacular week with a number of unique events and happenings? It might throw off a bit of your analysis in the weeks surrounding it. Creating a benchmark is a bit of an easier way to measure performance week-over-week and post-over-post. We’ve found post-over-post analysis to be especially helpful. For instance, on Twitter we identify popular tweets as those that gain 200 or more clicks. So when it comes time to check the stats, we can see at-a-glance which ones met those standards (and reshare them accordingly). 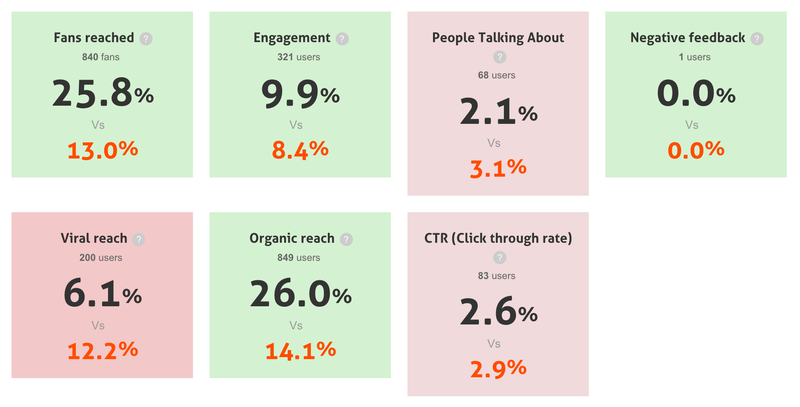 If you’re interested in more, SimplyMeasured has a great overview of four different ways to find social media benchmarks. For example, AgoraPulse can show you some of these benchmark stats for your Facebook page, customized for your specific size of followers (e.g., you’ll see different numbers if your page has 1,000 fans versus 10,000 fans). Automation—the process of setting up systems to work whether you’re around or not—can be super useful for managing multiple social profiles. Tools likeZapier and IFTTT allow you to sync up multiple apps so that when a certain activity happens it kicks off a separate activity in another app. 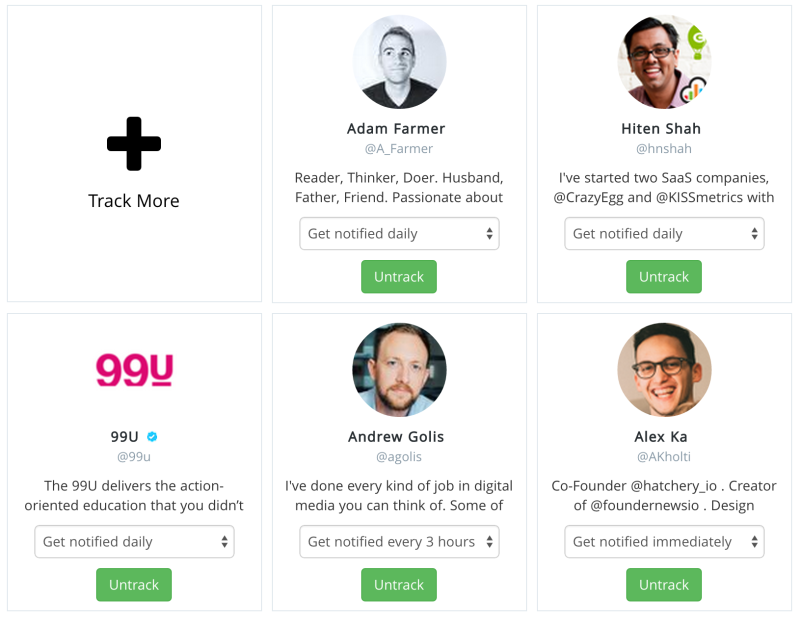 Zapier published a list of 101 ways to automate social media. Here are a few of their suggestions. We’ve shared some fun social media IFTTT recipes before, too—things like saving tweeted links to Pocket and welcoming new members to Facebook groups. Which social media management tips have been most useful for you? 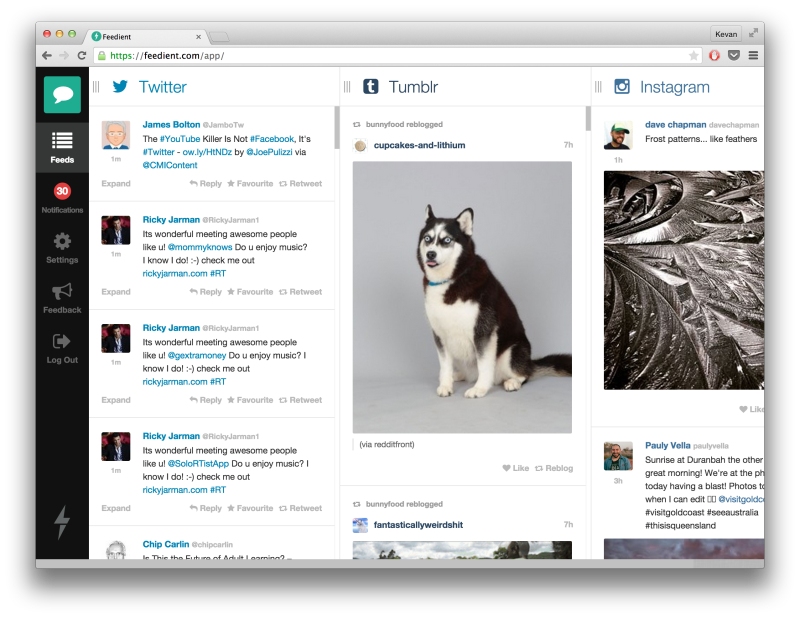 What are some of your most-used tools for managing multiple social media accounts? I’d love to hear from you in the comments and on Twitter!